The next time you end up in an Open or Save dialog window in Mac OS X, try out a few of these helpful keyboard shortcuts to make navigating around the dialog and filesystem much faster. This list is in the keystroke – description order, they work in any Save box or Open file window screen throughout Mac OS X and its apps. 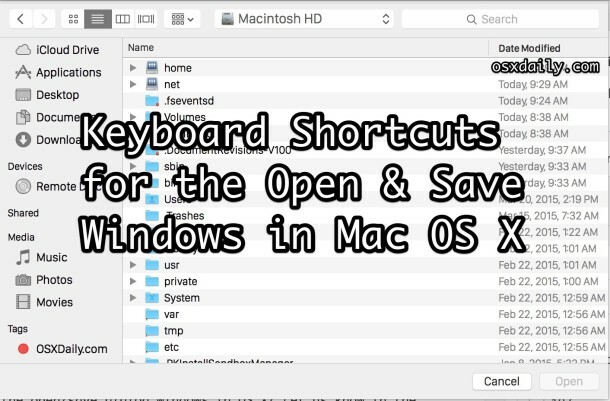 Remember these keystrokes and you’ll be jumping around the Open and Save boxes of OS X faster than ever before, keyboard shortcuts really help to master your Mac! And yes, these work in just about every version of OS X out there for Mac. 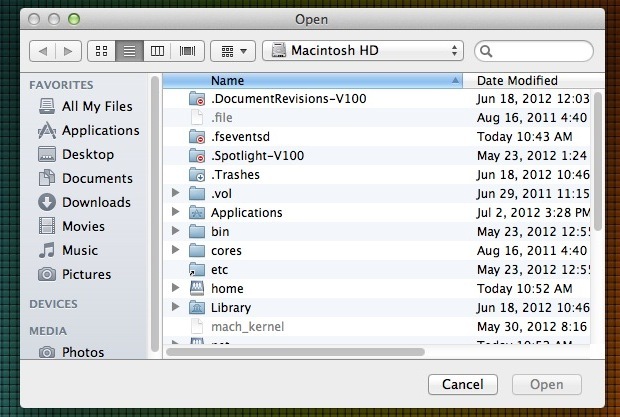 Know any other great keyboard shortcuts or usability tips for the open/save dialog windows in OS X? Let us know in the comments! You can also simply type / to bring up the “Go to the folder:” box. Command+Shift+C goes to the main Computer selection letting you select networked machines, other hard drives, external devices and more. Save dialog: click on any (grayed-out) file name in the list to copy it into the Save/Save As field. Paul, please add what JamesC said to the main article. I’m using the ‘/’ shortcut all the time — it is so much easier to remember than ‘Command+Shift+G’. After all, when you want to go to ‘/Applications/…’ you’d have to start typing a ‘/’ anyway, isn’t it? You can also start by typing ~ to start a path in your home folder. One shortcut I would love to know (if it even exists), is how to shift focus from the file browser area (e.g. column view, where I may have been arrowing around to get to a desired folder) back to the file name box at the top. As it stands now, I either have to use the mouse and click up in the box, or press Tab 5x, or sometimes 6? I think it differs in different conditions, but either way, I don’t know a reliable single-stroke keyboard shortcut.